In this accalimed and provocative new nonfiction book, Los Angeles dietitian Lisa Tillinger Johansen debunks the hype over the "evils" of fast food. With a mixture of fascinating research and engaging anecdotes, Johansen shows just how easily fast food can be incorporated into a healthy lifestyle. 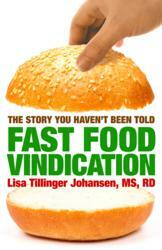 FAST FOOD VINDICATION is now available in paperback and all major ebook formats. In FAST FOOD VINDICATION, Johansen takes a lively, informative and realistic look at our eating habits, and, using her expertise and experience as a hospital dietitian, seeks to educate readers on making smart dietary choices no matter where they eat.